Every choice has consequences, and as unrest surges in the factions all around her, Tris Prior must continue trying to save those she loves – and herself – while grappling with haunting questions of grief and forgiveness, identity and loyalty, politics and love. Tris’ initiation day should have been marked by celebration and victory with her chosen faction; instead, the day ended with unspeakable horrors. War now looms as conflict between the factions and their ideologies grow. And in the times of war, sides must be chosen, secrets will emerge, and choices will become even more irrevocable – and even more powerful. Divergent ended with such a fantastic bang, that I knew despite already having purchased Insurgent I was going to be waiting to read it until Allegiant come out. 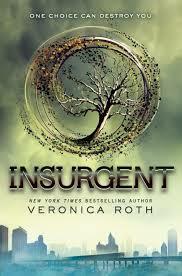 I was really excited when I could escape back into the fictional world that Veronica Roth created. The world building and back story that she has created came through flawlessly in Insurgent, a book that was considerably more action packed than Divergent. Insurgent runs high on emotions as politics, family loyalties and friendships are called into question and tough choices have to made. The overall emotional intensity of this books sets it apart from other Young Adult fiction novels that I’ve read and I found that refreshing. Veronica Roth has a way of exploring more mature themes but in a way that regardless of your age you’re able to identify and relate too. The relationship between Four and Tris is constantly tested throughout this book, and despite their differences, personal issues and their young age they deal with them maturely, with unconditional love and compassionate understanding once they allow each other in. They’re both hurting for different reasons and together they are stronger than they ever would be apart. Together, they are an unbreakable force, they are a team and one that I certainly wouldn’t want to tangle with. Four’s family background and beliefs are called into attention quite a few times in this book and we learn a lot more about him, mostly why he is the way he is today. He had very strong character development through out this novel. His loyalty to Tris is unwavering, he is heartwarming to read. Over all Insurgent was a good read. It left you waiting for the next and final installment in the series.